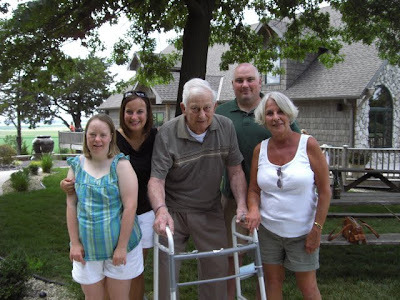 Confessions of the Chromosomally Enhanced: In loving memory of my grandpa, John. In loving memory of my grandpa, John. 1. He grew up in a large family of modest means on the border of Arkansas and Oklahoma during The Great Depression. 2. He was an ornery and mischievous little kid. He claimed that he got a whipping first thing every morning when he arrived at school in anticipation of all of the trouble he’d cause that day. 3. He only had an eighth grade education. After that, he dropped out to work in the coal mines to help support his family. 4. At 18 years old, he served his country in World War II. His memories of the atrocities he witnessed in the Nazi Concentration Camps haunted him so much that he rarely spoke about that time in his life. 5. Upon returning from war, he learned a trade and, despite his limited education, became a successful home builder. 6. He married my Grandma, started a family, and was a loving and devoted husband and father. 7. He provided his children with educational opportunities he never experienced. They received a Catholic school education and he ensured that they earned a college degree. 8. His daughter, my mom, got married and gave birth to Leanne five years later. Her disability was a moot point as far as Grandpa was concerned. He loved her unconditionally. 10. As children, Leanne and I loved spending the night at my grandparents’ house. My grandpa put a swing in the big tree in his backyard for each of us. He let us pick vegetables out of his garden. He made sure we always had good snacks: soda, pizza and anything made by Hostess. 11. He’d fall asleep in his La-Z-Boy and I would cover his face in my Grandma’s makeup and put her curlers in his hair. He never once got angry. 14. He gave everyone nicknames. They were usually after characters in the old Westerns he loved. I was “Shorty,” Leanne was “Slim,” and Travis was “Maverick”. 15. He was ornery until the day he died. Even though he knew it was against the law, he used to burn his trash in a barrel in his backyard. One day he set his yard and his neighbor’s tree on fire. I learned at the funeral that he told his buddies a squirrel had gotten up in the power lines and caused a big fire! 16. When my Grandma died, we thought he’d fall apart because she always ran the household. But he blew us away when he taught himself to cook, clean, and do his own laundry. 17. When he was no longer able to live independently, he insisted he go to the “Soldiers Home” so he could be with his fellow veterans. 18. He loved his wine. One day we busted him out of that VA Home and took him to a local winery. My mom poured him a tiny glass. When she wasn’t paying attention he looked over at me and said “Shorty, pour me another shot of that wine!” and I happily obliged. 19. Not knowing how many days we had left with him, we went out of our way on our drive home with Josie, to stop at the Veteran’s Home and introduce her to her Great Grandpa. He always kept a big picture of her on his bulletin board above his bed. Of course he never flinched at the notion of us starting our family by adopting a baby with special needs. Well, he got his wish. Camp Butler has a new resident and the beautiful cemetery that embodies such honor and esteem is an even more sacred place today. He is a card carrying member of “The Greatest Generation” and he has earned the respect, admiration, and gratitude of the fortunate few who were lucky enough to know him. Goodbye Grandpa. Words can’t express how thankful I am to have had you in my life. I love you. oh my goodness , what a beautiful post. Your grandpa sounded just perfect. So sorry for your loss. What incredible memories you have of him. And how lucky and blessed you are to be able to hold on to them. i'm sure he will always be close by. OH with tears streaming down my face I can tell you I LOVE this. My grandpa was like that too and I consider him to be one of the most amazing men I knew. There is such peace in knowing you will be able to speak of him and share memories and pictures with your babes forever. I am in tears reading your sweet tribute to you grandfather. Thankful he is dancing in heaven with your grandma now. Hugs to you and your family on your loss. I am so sorry.. what a beautiful person your grampa was. hang on to all those wonderful memories! Thanks for sharing your Gpa with us, he sounded like a great man with an incredible history:) May those memories warm your heart! Well thank you for sharing, your grandpa seemed like a real turkey!! That make-up part sounded funny, I would have never tried that with my grandparents. They were not mean, but strict and no nonsense! Nice to hear of such a "FUN" grandpa! !